Ready to plan some great family outings this summer in Tampa? Look no further. Tampa Bay’s Riverwalk, a 2.5-mile pedestrian-friendly sidewalk, links Tampa’s most popular attractions (including five museums, seven parks, and tons of must-try restaurants). Whether you walk, paddle or water taxi your way around, there’s plenty to do for the whole family. Check out some of our most memorable day trips below! We all know how hot our Florida summers can get – so take to the water! 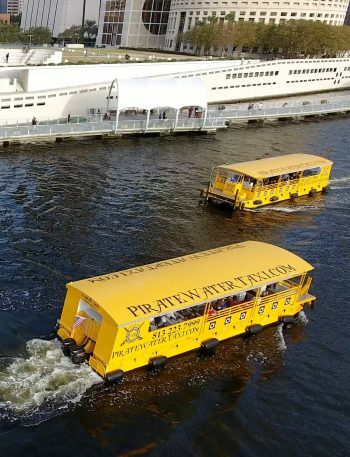 Pirate Water Taxis(yes, those adorable bright yellow boats) run up and down the Hillsborough river with multiple stops along the Riverwalk. You can hop on and off at your desired destinations all day while enjoying a new perspective on Tampa. Pro tip: show your wristband for (read: discounts and freebies) at many local restaurants and businesses, like the Florida Aquarium and the Glazer Children’s Museum! 20,000 aquatic animals and plants are waiting to say hello to you and your family at the Florida Aquarium! Twist and turn through 250,000 square feet of various exhibits focusing on climates from the Florida wetlands to coral reefs. Plan for a full day, and bring your swimsuit for the splash park! Highlights include playful otters, stingrays you can touch, and a jaw-dropping floor-to-ceiling tank that will have you and your little ones captivated. Bonus: it’s air-conditioned heaven inside. Wider than the Bayshore sidewalk and far from busy streets, the Riverwalk is the perfect place for a family bike adventure – especially if some members of your party are still a little wobbly! You’ll cruise past some of Tampa’s iconic buildings, including the University of Tampa and the Sykes building, and there are plenty of great stops for food, water and activities along the way. Read on for our favorites! Named for a legendary Native American princess, Ulele is one of Tampa’s newest restaurants, renovated from one of its oldest buildings. Today, the restaurant Ulele is one of Tampa’s must-visit spots on the Riverwalk. With plenty of green space for kids to run around, parents can take a breather, enjoy some seriously delicious and unique food, and watch the kids play while enjoying a beautiful view. This one is a bit farther up the river, so we recommend hopping on the Pirate Water Taxi to get there (added perk: no parking hassles)! The Tampa Bay History Center has three stories of exhibits covering over 12,000 years of Florida history – many designed especially for kids. (Stay tuned for the soon-to-be competed 60-foot replica of the original explorers’ pirate ship that arrived in Florida over 500 years ago!) Finish off your tour with a bite to eat from Florida’s oldest restaurant, the Columbia Cafe, which was established in 1905. The Columbia Cafe has served some of history’s greats – Babe Ruth, Marilyn Monroe, and now you and your family! A mini play area outside the cafe is a great way to get some wiggles out, before or after you become an expert on your state’s history. Continue down the Riverwalk to the Sail Pavilion, a 360-degree outdoor Sports Bar & Grill on the waterfront, where you can rest your feet and enjoy live music and views. Get excited for the great selection of menu item for mom and dad, and virgin piña coladas that make a cool treat for kiddos. A simple kids’ menu is also available for some midday refueling. Best of all, the Sail is dog friendly, so feel free to bring your furry friends – or just enjoy the cuteness! This excursion is perfect for families with older children. Located behind the Marriott Waterside, Urban Kai Paddle Boarding offers a range of family activities, including guided excursions, paddleboard yoga and paddleboards you can rent by the hour. Prices range depending on the amount of paddlers in your group. Don’t forget your GoPro or waterproof camera to capture all of the great memories you and your family will make out on the water! Need a break? The park is the perfect place to relax and enjoy the beautiful view of the Hillsborough River while the kiddos enjoy themselves in the splash pad. (Don’t forget towels!) There’s also plenty of room to toss a Frisbee or kick a soccer ball around. Pack a picnic lunch and blanket for a perfect park day, or escape into the air conditioning at the next stop on our list, which is right next door. The Glazer Children’s Museum is all about engaging children in the process of discovery through play. The museum offers over 170 interactive exhibits! We love the utter playfulness of the “Forts” exhibit, where you can take your family’s fort-making skills to the next level with provided materials. Events change often, so check the museum’s website to stay up-to-date on all of the fun interactive programs. While not technically on the Riverwalk, the ZooTampa ar Lowry Park Zoo is easily accessible by water with our favorite Tampa water taxis! A special route, appropriately named the Zoo Express, will cruise you and your family down the Hillsborough River directly to the Lowry Park Zoo, where you can spend the day with over 1,000 different animals.Bonus:with the Zoo Express Combo Pass, you can save $8 on an adult ticket and $6 on a child ticket! We can’t wait to hear about your summer adventures in Tampa Bay!